Music is a gift from God that can reflect our mood and reset our mood. We’ve talked about things we can do to feel better, like exercise and forgiving others, but did you know music can also make you feel better? Studies show our brains release dopamine when we listen to music that evokes strong emotions. 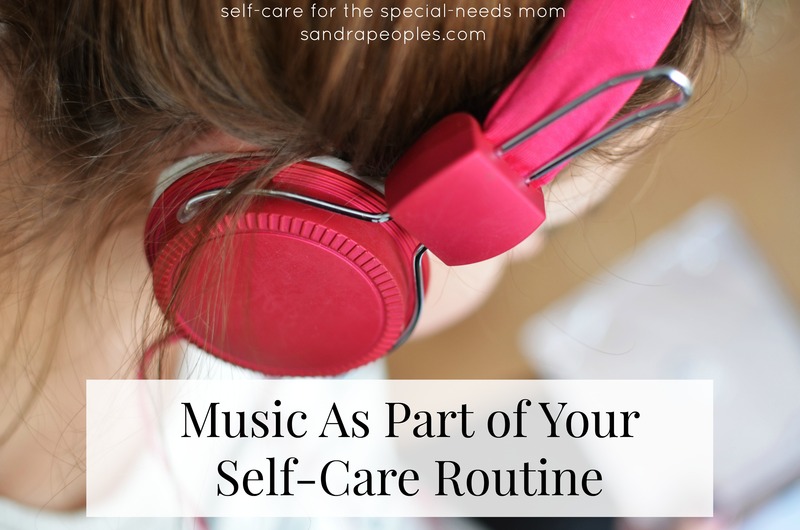 Music can be an important part of your self-care routine. We see the importance of music as a way to express emotions throughout the book of Psalms. David and other Psalmist praise and lament through songs. Sometimes you want a song to boost your mood. Sometimes you want a song that reflects your mood so you don’t feel alone. Music is a gift that can do both. Spotify: Spotify is a site/app that allows users to create playlists. They have everything from “songs to sing in the car” to songs that inspire when you’re making dinner. I like hymns for hipsters on Sunday mornings and marching band favorites on Friday nights. Pandora: Pandora is another fun site/app. It generates playlists based on what you tell them you want. I listen to my “movie scores” channel when I’m writing/editing (I don’t like music with words when I’m dealing with words). Streaming music sites: Amazon Prime Music and iTunes Radio both stream music (for a fee). If I’m interested in an album or artist, I search on Amazon Music app first to see what’s already available. Sandra McCracken is a new favorites of mine and her entire Psalms album is on Amazon Prime so I can listen to it anytime. My own playlists: I love creating playlists from the songs I own on iTunes. “Youth Group Throw Back” and “Pep in the Step” are two of my favorites that instantly improve my mood (and the moods of my boys). We used to have to buy entire albums just to listen to the couple of songs we liked. But now we can just buy our favorites songs and put them together in a playlist full of songs we never want to skip. I even found evidence that singing with a group can increase connection and feelings of joy, so join your church choir, find a place for karaoke for you next girls’ night, or just start a family sing along on your way home from school. Enjoy the gift of music today!